...there's always something to do. 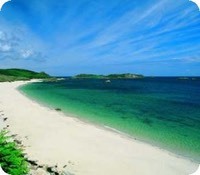 Whether you are a sailor, a walker, a bird watcher, an artist, a connoisseur of sunsets, a seeker of sun-bleached hair and the perfect tan, a lover of real ale, or someone who simply appreciates stunningly beautiful and ever-changing seascapes, then Scilly is for you. As for children, it is hard to imagine anywhere more perfect, whatever their age. The youngest need little more than a white gold sandy beach, sparkling blue sea, some five-star rock pools and a bucket and spade. It's all here. With almost no traffic on the islands, older children can explore on their own, safe in the knowledge they can't get lost. There are nature trails, horse riding, crabs to be coaxed from their hiding places in the quay walls, shrimps to be winkled out from under the weed with a net, bikes to ride and boats to mess about in. And professional instructors can teach them to sail, to windsurf, to canoe, to scuba-dive, to rock-climb. �Adults enjoy doing most of those things too. They can also play golf, tennis and squash. They can wander into the many artists' studios and workshops, or just put their feet up outside the nearest pub and wait for the light to create endless variations on one particular view. �And if all this is a little too pacey, they can look forward to Sunday, traditionally the quiet day of the week (apart from fiercely-fought inter-island cricket matches). 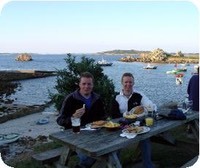 Exploring by boat is the mainstay of holidays on Scilly. Who can resist crossing that crystal-clear water, escorted by seabirds. 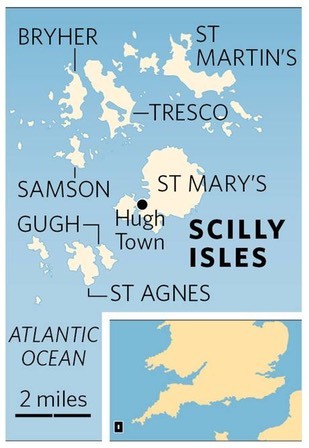 You can be driven right round the Islands in less than an hour in a fast 'RIB' (Rigid Inflatable Boat). You can 'go slow' aboard a traditional sailing boat. You can join one of the regular expeditions to see the seals which sun themselves on the Eastern Isles and Western Rocks: (seals tolerate the sound of boat engines, but are unnerved by the sound of loud voices). Most people are content most days with the regular boat services run by skilled and amiable boatmen who do whatever it takes to make sure everyone gets to where they want to go. Pilot Gig rowing is Scilly's main sport. The Islanders race these traditional six-oar wooden boats - some more than a century old - on Wednesday and Friday evenings. Locals and visitors pile onto the passenger boats together and give chase, yelling partisan encouragement. There's an annual World Championship which attracts boats and their crews from all over the world. "There were fifty boats on the start line. When the flag dropped, 300 oars all dipped at once! The sound made the hair stand up on the back of my neck!" 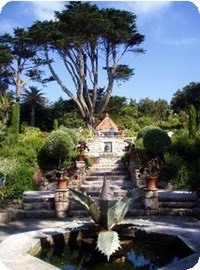 �The first time you arrive in the Isles of Scilly you may wonder what there is to do. When you leave the second and third time, you'll wonder where time went.